The South Korean government said Thursday it has been preparing emergency measures to minimize damage from Typhoon Soulik, which battered the southwestern region earlier in the day and is forecast to hit other parts of the nation later. 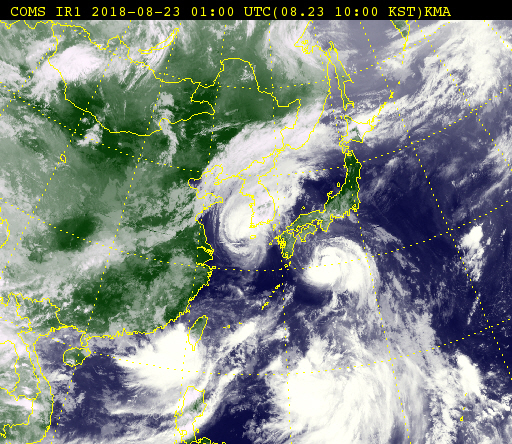 Major ports, farms and utility firms are bracing for Soulik, which is the first typhoon in six years to make landfall on the Korean Peninsula. This year's 19th typhoon struck the southern island of Jeju overnight causing heavy rain and gale force winds overnight. It caused a person to go missing and blackouts for more than 6,000 households, according to the Korea Meteorological Administration. The typhoon is forecast to batter Seoul early Friday morning, which could result in considerable damage during rush hour time. The oceans ministry said it has ordered vessels evacuated from ports and checked the safety of major ports to minimize damage. The agriculture ministry has been operating an emergency response team to monitor reservoirs and drainage stations, as well as greenhouses and other agricultural facilities. Days before the typhoon approached the Korean Peninsula, the government advised local farmers to harvest fruits and vegetables as much as possible to prevent them from falling from strong wind and heavy downpours.